The Campaign For Wool is an initiative supported by HRH The Prince of Wales as part of his drive for universal sustainability. The aim is to further promote wool as a sustainable and high performance material. Its properties as a natural fibre make it far superior to manmade alternatives, and its benefits to the environment are overwhelming. If you haven’t already, you simply must try out our gorgeous range of knitted wool products. Visit their official website here. Wool is a natural fibre, not manmade. The sheep has evolved to produce a fibre that has become one of the most effective natural forms of all-weather protection known to man. Significantly less energy is required in the production of wool products compared to manmade fibre options – this ensures carbon dioxide emissions are kept low. Every year sheep produce a new fleece, making wool a renewable fibre source. Woolgrowers actively work to improve efficiency and care for natural resources, endeavouring to make the wool industry sustainable for future generations. When a natural wool fibre is disposed of it takes only a few years to decompose. Most synthetics on the other hand, are extremely slow to degrade. The benefits of durability and appearance retention reduce frequent replace and renew consumption which contributes to landfill and CO2 emissions. Wool can insulate the home, providing and retaining heat and warmth, helps to reduce energy costs and prevents the loss of energy to the external environment and so reduces carbon emissions. Wool has a natural structure which allows it to absorb and release humidity either in the atmosphere or perspiration from the wearer. It is able to acclimatise to individual environments – ensuring that the room or wearer is never too hot or too cold. Wool has a large capacity to absorb moisture vapour (up to 30% of its own weight) and sweat next to the skin making it extremely breathable. A wool fibre can be bent 20,000 times without breaking, and have the power to elongate, stretch and recover – this is why wool products last for years. Wool maintains appearance in the longer term – this reduces the need to replace and adds value to the product. Natural wool has a wonderful hue, and when dyed wool is colourfast. Wool is active, reacting to changes in one’s body temperature to keep you warm when you’re cold but releasing heat and moisture when you’re hot. 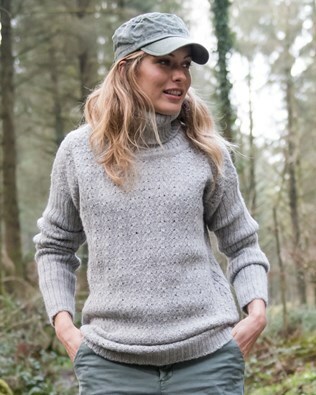 The natural elasticity of the wool fibre means it stretches with the wearer, but then returns to its natural shape, so there is less chance of garments sagging or losing their shape. Recent innovations mean wool items are no longer hand-wash only, many wool products can now be machine-washed and tumble dried. Wool fibres have a natural protective layer which prevents stains from being absorbed; they also pick up less dust as they are static resistant. Wool is naturally flame retardant due to its high water and nitrogen content, has a higher ignition threshold than many other fibres and will produce less toxic and noxious fumes that cause death in fire situations. As wool absorbs moisture it reduces the amount of sweat left on the body, therefore reducing the amount of odour produced. Wool is not known to cause allergy and does not promote the growth of bacteria. Wool can reduce floating dust in the atmosphere, the surface of a single wool fibre is covered in microscopic scales that will trap and hold dust in the top layers until vacuumed away. We're committed to only using natural fibres from sustainable sources. We’re proud to say that our boots and slippers are made using genuine British shearlings. These premium skins are a by-product of the food industry, so you can shop with a clear conscience knowing nothing is wasted. Almost all our products are made in the UK or Europe, and we are proud to support British industries wherever we can.